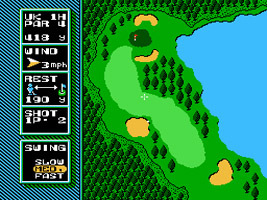 A golfing game on the NES featuring a cast of Mario characters, and courses from the U.S., Japan, and the U.K.
Hit the ball across the green and into the hole within par. The accuracy and drive of your swing is determined by a power meter. Beware of the water and sand traps on each course. Take part in a huge range of play modes, including Stroke, Match, and Tournament. All modes can be played against the computer or a human opponent. The Club House contains your high-scores, training areas and play options. You can even record your best plays to watch again at a later date. 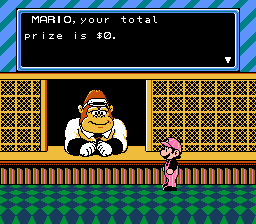 In the Clubhouse, select the Prize Money option and you will be greeted by Donkey Kong, wearing a shirt, tie and hat. He will tell you how much prize money has been earned to date in the game. While it is undoubtedly a coincidence, it might be worth mentioning that this is the first time Donkey Kong is seen wearing a necktie.